Hands up those who love to play Role Playing Games (RPGs). Today, we have compiled a list of the best RPG games for iPhone and iPad came out in 2014 and in 2015. Enjoy! Role-playing games are among the most downloaded and popular with gamers because of their ability to catapult a few seconds in a parallel world and make you forget the real life. Apple’s App Store offers a multitude of RPG games, but only a few are in the degree to offer levels and graphics really compelling and immersive. Here we made a selection of the best free Role Playing Games for iPhone and iPad, so you can quickly choose the ones for which it is worth investing time. If you are fond of adventures online, to share with friends or strangers, Order & Chaos Online is the best way that you can choose for your device. It is a beautiful game and good plagiarism of World of Warcraft. If you have played WOW, here you will be almost at the same game: missions, challenges that will need the help of a group, addiction based on the passage of the levels etc. Zenonia 4 is an RPG with an old fashioned view, eight-directional movement and a great story very compelling. The fights are extremely fluid and responsive, with a very high-quality graphics. Choose the best strategy and equip your hero (Slayer, Balder, Ranger or Druid) with countless armor options, weapons and items. 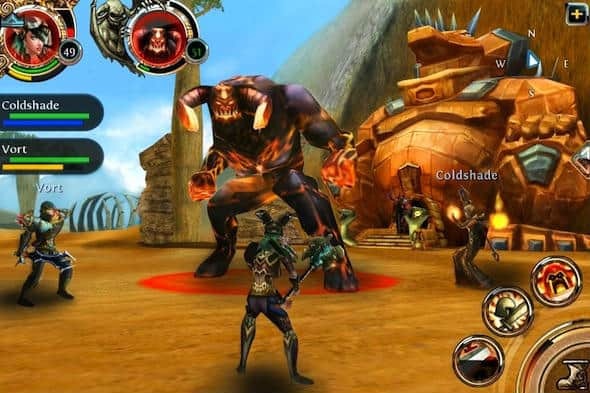 King’s Bounty: Legions is a legendary game, which has hundreds of thousands of fans around the world. Immerse yourselves in the fantasy world as a hero with a strongest army of magical creatures. Fought against enemies, to save worlds, test your friends “to the tooth”, calling for a duel! The game provides a huge space for research, hundreds of fun activities and a 3D-graphics, a world of fantastic creatures and splendid adventure story. Final Fantasy Record Keeper is an RPG game for iPhone that will make you relive the 90s battles and completely free! This interesting classic game will give you a unique experience thanks to its retro style, his epic turn-based battles, and musical atmosphere. It offers a perfect combination between traditional elements of the series and a touch control that provide fabulous maneuverability. Quadropus Rampage is a fun, fast and dynamic Role Playing Game for iPad and iPhone. This game has beautiful graphics and a decent story. In Quadropus Rampage, you’ll face sea creatures driving an octopus. Inotia 4 is a great RPG game for iPhone and iPad that takes more and more as you play. With beautiful graphics, top view three-quarter, Inotia 4 is a nice RPG game easy to play and suitable for both experts and novice players. Blood Brothers 2 is an RPG game full of strategy. The gaming experience offered is undoubtedly compelling and completed by a graphic in dark style, perfectly realized. The main aspect of the game is a battle system which sees several units of soldiers clash in shifts, giving the possibility to play multiplayer and challenge other gamers around the world. Taichi Panda is an action-RPG type Hack & Slash. Become the hero in this exciting free-to-play Role Playing Game and discover the mystery upsetting the cosmic order. Good graphics and excellent playability, with the possibility to join other players in multiplayer. With these free titles, you can always find some time to enjoy great adventures. Of course, these are not the only titles in the genre of Role Playing Games for iOS. And if you have any suggestions do not hesitate to share.